The Kremlin on Wednesday said that countries should avoid taking action that could further destabilize war-torn Syria. "As before we would hope that all sides will avoid steps that in reality are not provoked by anything and that could destabilize the already fragile situation in the region," Kremlin spokesman Dmitry Peskov said. U.S. President Donald Trump has threatened military action after last weekend's suspected chemical attack on a rebel-held town near Damascus, which activists and rescuers say killed at least 40 people. The Syrian government and its ally Russia denied that such an attack ever happened. The Syrian government invited the independent Organization for the Prohibition of Chemical Weapons (OPCW) to investigate, CBS News correspondent Seth Doane reports. Russia also sent its own military investigators to the scene, who claimed to have found no traces of chemical weapons. In a tweet on Wednesday, Mr. Trump warned Russia to "get ready" for missile strikes in Syria. Russia's Foreign Ministry responded, saying "smart" missiles referred to by Mr. Trump would destroy evidence of a suspected chemical weapons attack. "Or is it the original idea to use the smart missiles to sweep the traces of the provocation under the rug?" Maria Zakharova, spokeswoman for the Russian Foreign Ministry, wrote in a Facebook post. Earlier on Tuesday, Russia threatened to retaliate if missiles were fired at Syria. "If there is a U.S. strike... the missiles will be downed as well as the sources they were fired from," Russian Ambassador to Lebanon Alexander Zasypkin said. 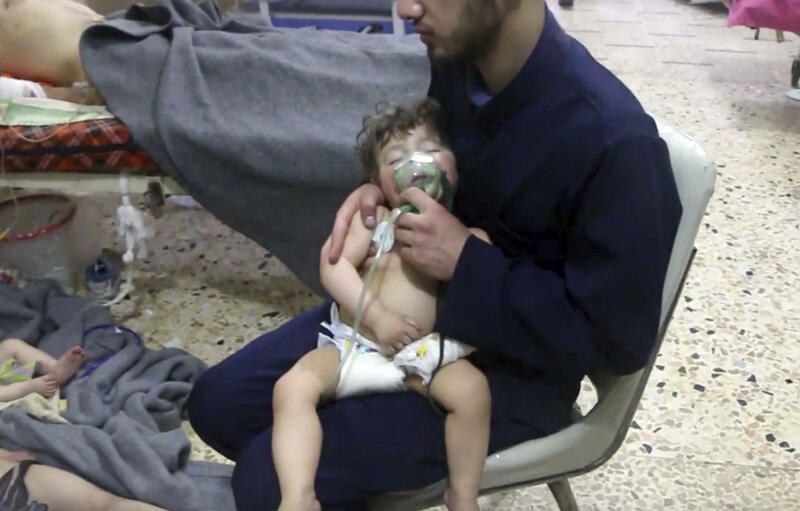 Meanwhile on Wednesday, the World Health Organization (WHO) issued a statement demanding access to the site to provide care and saying around 500 people had presented to health facilities exhibiting symptoms of a chemical attack. "WHO demands immediate unhindered access to the area to provide care to those affected, to assess the health impacts, and to deliver a comprehensive public health response," WHO Deputy Director-General for Emergency Preparedness and Response Dr. Peter Salama said. Russia has been a key backer of Syrian President Bashar Assad, providing air cover for his offensive against the Islamic State of Syria and Iraq (ISIS) group and Syrian rebels. Russian military advisers are deployed at many Syrian government facilities.